Our special guest bloggers today are “paws”itively adorable. 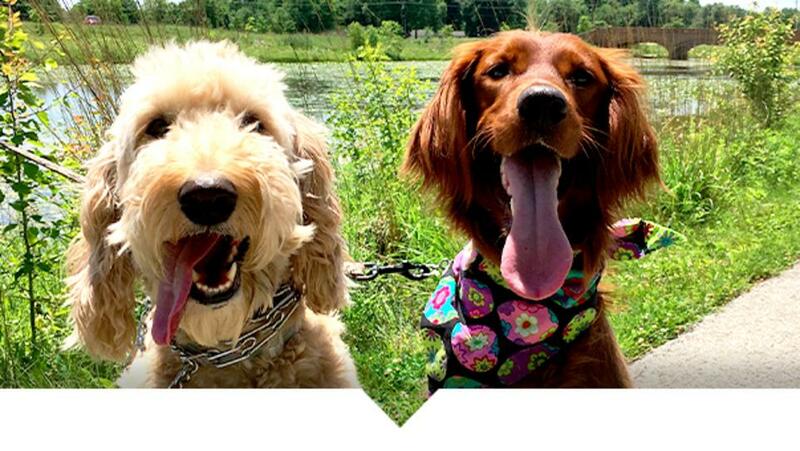 Meet Pumpkin, a two-year-old red retriever, and Piper, a four-year-old golden doodle. These pups picked their favorite places to walk in Hamilton County - let’s just say they drool over these dog-friendly areas. "When we aren’t running around in our backyard together, we like to frolic Central Park because of the walking trails and boardwalks. Plus, it connects off the Monon Trail." "The next best thing to sleeping on Dad’s feet at home is exploring all the nature at Cheeney Creek. Birds and squirrels everywhere!" "We don’t go off-leash, but if we could, we would run the 125 acres of Coxhall Gardens, passing the bell tower and stopping at the Children&apos;s Garden for some head rubs from children playing." "Water! Water! Water! There’s five miles of trails out here and a pond! We love to splash in the water and swim – except our owners usually try to hold us back. Sorry, mom and dad." "Our owners seem like to take a lot of pictures out here. No wonder - the park has rolling hillsides, woodlands, creeks and native prairies – plenty of spots for us to roll around and sniff!" "Our tails won’t stop waggin’ when we visit here! Next to car rides, belly rubs and treats, we love visiting Ritchey Woods – mostly for the trails and shaded areas from the woodlands!" "We can’t do archery, ride the horses or glide on the zip lines, but we sure do get excited about the hiking trails out here! With 750 acres of land, we could spend the whole day roaming around." We give these trails and parks two paws up, but we love discovering new places – did we miss your favorite? Let us know in the comments below and be sure to follow us on Facebook, Twitter and Instagram for more paws-itively fun things to do in Hamilton County, Indiana. Whitney Riggs serves as the Communications Coordinator for Hamilton County Tourism. Whitney is new to the area and learning (and loving) more about Hamilton County each day. She has a journalism background from Indiana University and worked in newspapers before making the switch to public relations almost two years ago. She’s a dog mom to one, a wannabe yogi and forever news junkie.